New Delhi: The Indian government is considering a proposal to withdraw import and local levies which, if approved, would reduce the landed price for liquefied natural gas (LNG) significantly. Together with the fact that international crude oil prices, and thereby of LNG, are winding down, the reduced price would make it viable for domestic power companies to buy the fuel from the spot market. While Indian power projects are yet to tie up for long-term gas supplies, they have been buying LNG in the spot market, where prices are around $14 (Rs697.20) per million British thermal units (mBtu), to meet the shortfall. A waiver of levies will reduce the price by some $1.68 per mBtu, which in turn will bring down the variable cost for a power project by Re0.70 per unit. India imports around 3 million tonnes per annum, or 12 million standard cubic metres per day (mscmd), of gas bought in the spot market—primarily sourced by Shell India Pvt. 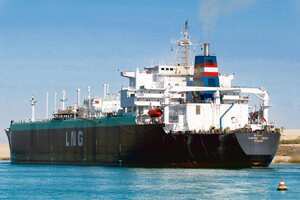 Ltd and Petronet LNG Ltd. The remaining comes from local production and long-term supply contracts with overseas sellers. The petroleum ministry estimates India needs around 180mscmd of gas for which supply is around 81mscmd. The proposal to waive 5% customs duty on LNG and giving it a declared goods status, whereby it will be subject to a uniform 4% levy across the country, will be considered by a group of ministers, or GoM, on the power sector. If approved, it will require to be endorsed by the cabinet. The GoM members include power minister Sushil Kumar Shinde, finance minister P. Chidambaram, science and technology minister Kapil Sibal, law minister H.R. Bharadwaj and Montek Singh Ahluwalia, deputy chairman of the Planning Commission. “This will help sourcing gas for fuel-starved projects such as Dabhol and NTPC’s projects. LNG prices as such are very high, leading to a project efficiency of 50%," said a senior Central Electricity Authority (CEA) official, who did not wish to be named. CEA is India’s apex power sector planning body. A similar demand was made last year by the power ministry for the complete waiver of customs duty on the import of LNG, but was not considered by the finance ministry. India has a power generation capacity of 145,000MW, of which around 10%, or 13,691MW, is gas-based. Of the 78,577MW that the country aims to add by 2012, some 5.45%, or 4,290MW, of gas-based capacity has been planned. “Given the ruling prices of LNG and the rupee depreciation, this will come as a welcome relief for power generators and will facilitate their participation in the short-term power market," said Anish De, chief executive officer of energy consulting firm Mercados Asia.